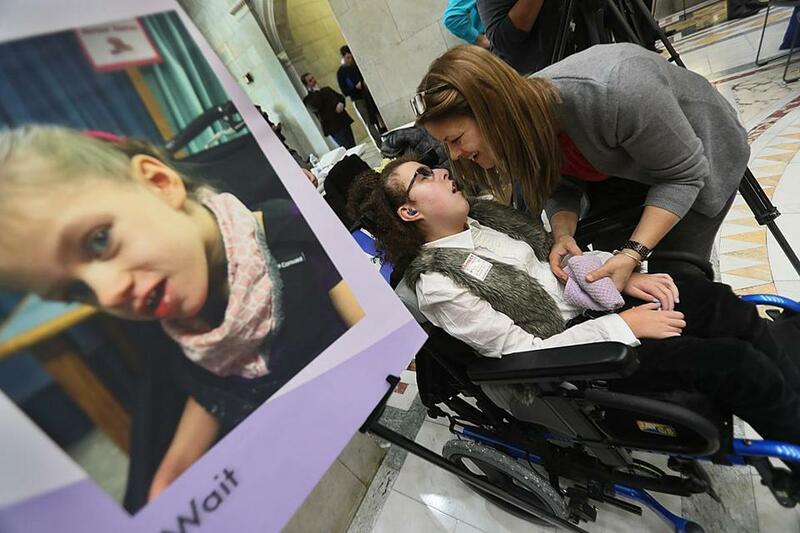 At the State House, Noelia Ferreira talked to her daughter Abi as the Massachusetts Pediatric Home Nursing Campaign met to raise awareness about families who are not getting enough skilled nursing care for their children. As dozens of advocates and legislators buzzed around her Tuesday morning, Abi Simpson dozed lightly. The teenager, who loves bowling and playing on her iPad, showed up to the State House with blue-polka-dot-painted nails to match her electric-blue wheelchair. She was born with a rare chromosome disorder that left her unable to walk or speak, so her mother, Noelia Ferreira, did the talking for her. The Massachusetts Pediatric Nursing Care Campaign, which organized Tuesday’s gathering, hopes to shed light on an issue that has flown under the radar for more than a decade: a dearth of nurses to provide in-home care for children with complicated, long-term health care needs. Ferreira, a working single mother, has struggled to find nurses for her daughter since the day Abi was born. She heard about the nursing care campaign from her friend Erin Ward, whose 15-year-old son Will Ward — an avid Red Sox fan with a sunny outlook on life — is living with a muscle disease called myotubular myopathy. The campaign is chaired by Angela Ortiz, whose 3-year-old daughter Ayla has struggled with health problems since birth, undergoing heart surgery three days after delivery. The campaign, officially launched by Ortiz in April, is promoting a bill that would guarantee high-quality, consistent care for kids like Abi, Will, and Ayla. It’s sponsored by Senator James Timilty and Representative Denise Garlick. Under the current system, Medicaid, called MassHealth in Massachusetts, approves a certain number of hours of in-home nursing care for about 900 families whose children have complicated medical issues. But according to data from the Home Care Alliance of Massachusetts, which represents home-care agencies, nearly half of those patients do not receive as much coverage as they have been approved for. 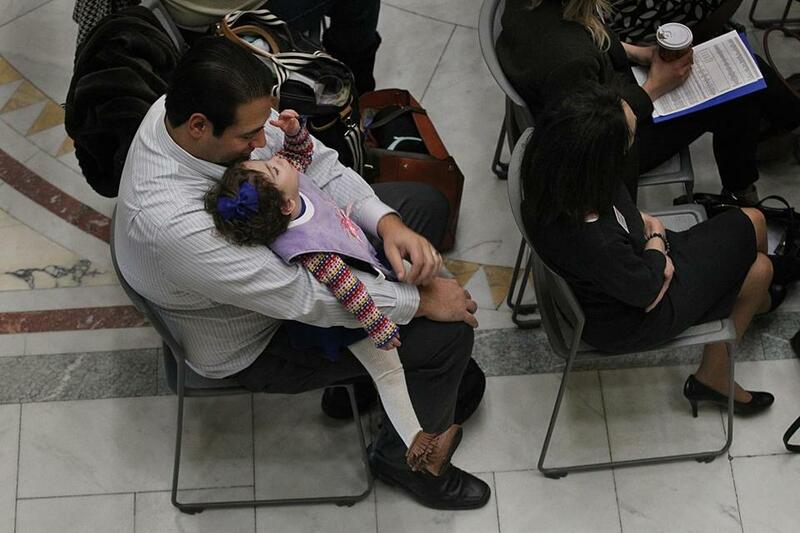 Manny Ortiz and daughter Ayla went to the State House to show support for a bill to help expand in-home nursing. Under MassHealth’s Continuous Skilled Nursing program, home-care agencies are reimbursed after providing nurses for families like Ferreira’s. The rate is currently around $44 per hour, according to data gathered by the Home Care Alliance of Massachusetts. Patricia Kelleher, executive director of the alliance, said a rate hearing later this month could raise the reimbursement rate by 2.5 percent — but that won’t be nearly enough for the agencies to compete against hospitals. A 15 percent raise, she added, would be a better starting point. Timilty is looking beyond this month’s hearing, and toward next year’s state budget. He stressed the importance of getting out in front of this issue early — though the bill currently does not call for a specific rate increase or budget allocation. “We’re up to bat, not even on first base yet. But I think we’ll be looking for as much as maybe $16 million worth of spending,” he said, adding that he would take it up with the Senate Ways and Means Committee in the spring. Unless the rates change, the home care nursing shortages and high turnover rates are likely to persist. For Ferrerira, and other parents like her, that means continuing to handle a dizzying array of machines and medications — and training every new nurse that comes into her home. Jacey Fortin can be reached at jacey.fortin@globe.com. Follow her on Twitter @JaceyFortin.